Software quality refers to the degree a system, component, or process conforms to specific requirements or expectations. In many instances, end users know “quality” software when they see it. This software is easy to use and error free. It also enables users to perform tasks quickly and effortlessly, on any device, and at any time. 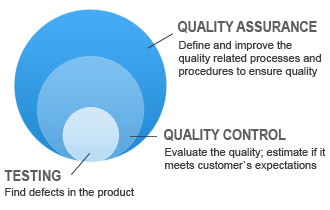 For software developers, software quality assurance is a moving target. In fact, many software QA standard changes have forced developers to reconsider how they build a software development plan. The word “quality” can be defined in many different ways. Most of the time the word is used to describe how a customer rates a product. It often depends on criteria such as general satisfaction, functionality, and willingness to pay. However, Software Development takes the definition in another light. When speaking of software quality, it takes into account the delivery of the functional requirements. It has to insure that the source code fits within the software architecture at the unit level as well as the system level. For example, imagine an old-fashioned grandfather clock that is still running on gears.Not only does each individual gear have to be made with precision and perfection at a unit level, but they also have to fit perfectly among the other gears within the clock to make it work. Blockchain: With blockchain, businesses can securely distribute digital information to one another. Blockchain promotes data accountability and transparency, and as such, is becoming increasingly important to developers who create apps for firms in financial services, healthcare, and other highly regulated industries. Artificial intelligence (AI): Thanks to AI, developers can build apps that initiate interactions via push notifications. Today, apps, bots, and virtual assistants use AI to know what to do and when to do it. Machine learning: The rapid increase in pre-built modules and usability with large datasets has pushed machine learning to the forefront of developers’ everyday operations. Serverless architecture: Developers can now write actions as serverless functions in various languages, thereby eliminating the need for application servers. Autonomous software: Software is becoming more autonomous, and as the amount of data and scale of software development projects continue to grow, developers must spend more time than ever before dealing with debugging issues. Although quality work isn’t always the most exciting work done by a tech company, it is some of the most important, providing great value to the final product. If you have ever been frustrated with technology in your life before, oftentimes it is a result of lack of quality. There are fundamentals to every skill set out there, and quality is at the base of being a developer.